Click here and submit your 2019 Conference Proposal for Collect, Connect, Change: Empowering Changemakers to Action today! 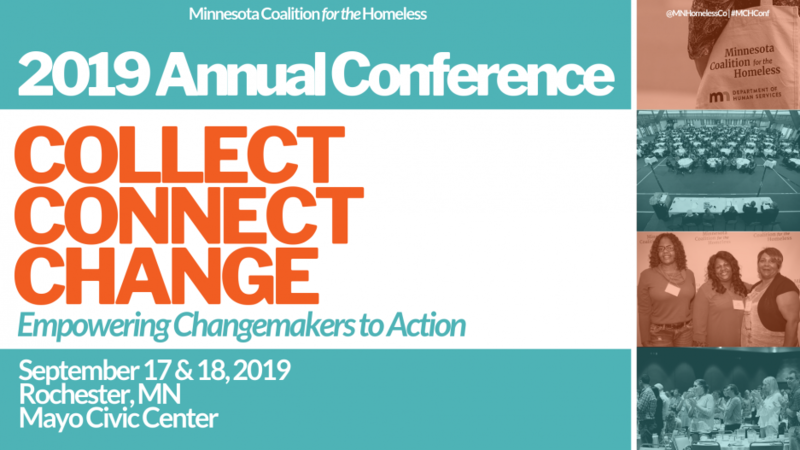 The Minnesota Coalition for the Homeless seeks workshop proposals for our 2019 conference through May 20, 2019. Minnesota’s collective efforts to end homelessness are unique in the nation. Together, we have built cross-sector, bipartisan partnerships that have changed the narrative about homelessness and led to strategic, targeted investments in affordable housing. MCH supports and defends legislation that protects resources utilized by low-wealth and under-resourced communities, including communities of color and/or Indigenous communities. Our advocacy strives to create collective change through connecting Minnesotans and statewide resources–we will not stop until everyone has a place to call home.